Sony Pictures, through the efforts of Sony Global Business Services, awarded a Greener World Grant to De La Salle University to support the community efforts of the Br. 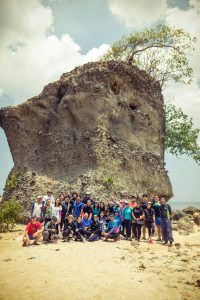 Alfred Shields FSC Ocean Research (SHORE) Center in Lian, Batangas. 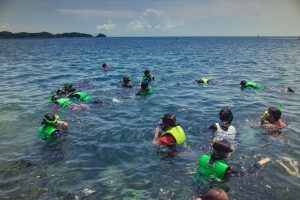 Part of the grant will go to the improvement of the tourism facilities in Sitio Kay Reyna, where residents are being trained as eco-tour guides and reef rangers in order to protect the rich marine life in their area. 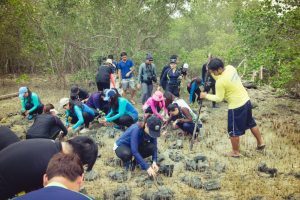 Last April 30, a total of 30 Sony volunteers together with SHORE Director Dr. Wilfredo Y. Licuanan and SHORE Center staff planted 300 mangrove seedlings and conducted snorkeling activities to explore the corals and other sea organisms in the Sitio Kay Reyna Marine protected Area.